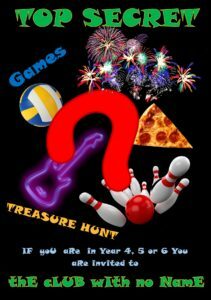 Games, activities, trips, pizza and lots of messing about for children in school years 5 to 6 (age nine to eleven). Recent sessions include Indoor Olympics, St Peter's bake off, School of Rock, Light Night, and bowling. £10 per child for the term. Please note that registration in advance is required, and places are limited. If you haven't yet registered, please CONTACT US to enquire about availability.